Every year around Thanksgiving time our family makes Friendship Soup jars. Lots of soup jars. We give them as gifts, and we keep them on hand for easy, yummy winter meals. And we ALWAYS have our Friendship Soup for Christmas dinner. Recently, I’ve been eating Trim-Healthy-Mama style and easing my family into this healthier way of eating. So this year when Thanksgiving time came and I started dreaming of soup jars, I worried for a minute that I might not be able to eat my beloved Friendship Soup. I did not want to surrender this dear family tradition! Fortunately, when I pulled out my old recipe, I discovered that I only had to tweak 4 of the ingredients to make it a marvelous E meal fit for any Trim Healthy family! We did a trial run, and everyone in the family loved the new version just as much as the old! 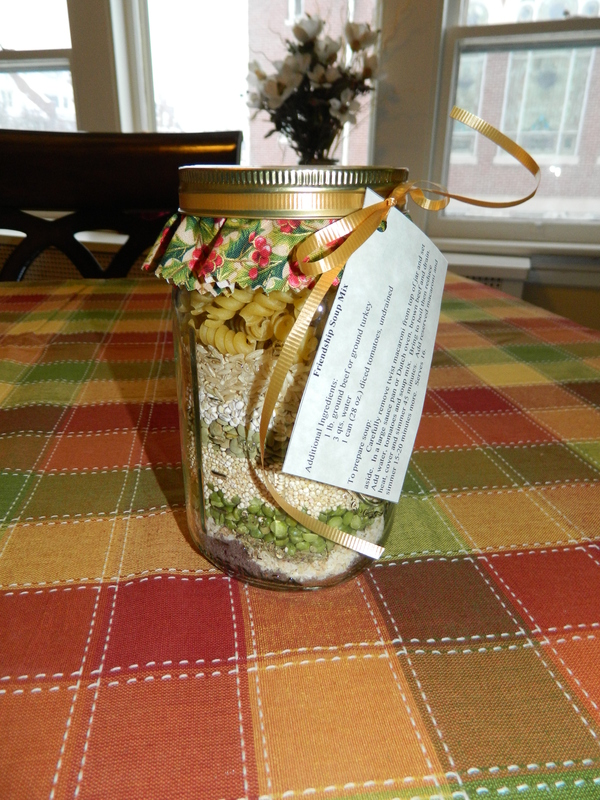 The original recipe was a combination of several recipes for Friendship Soup Mix in a Jar that I had found online. I have had wonderful responses to the old version over the past 10+ years and have been asked for the recipe many, many times. So here I will share the revised THM E-version of the recipe (with the old-version ingredients listed in parentheses). Layer ingredients in order in a 1-quart canning jar. Using a funnel with about a 2-inch neck may make this easier to do. 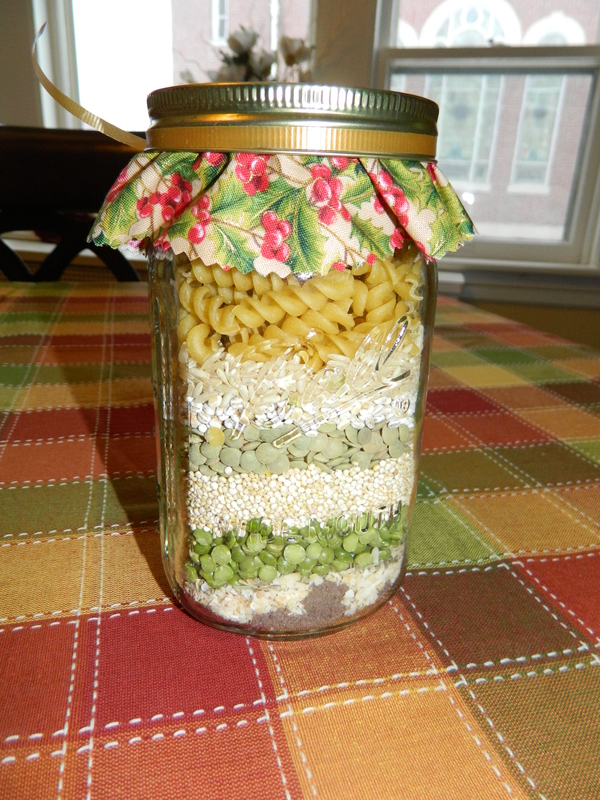 Carefully remove Dreamfields rotini pasta from top of jar and set aside. In a large sauce pan or Dutch oven, brown turkey (or beef) and drain. Add water, tomatoes and soup mix. Bring to boil then reduce heat, cover and simmer 45 minutes. Add reserved rotini pasta and simmer 10 minutes more. Serves 16. Once upon a time (8 years ago), the Geek and I attended an open house at a local classical Christian school and fell in love with classical education. Watching scores of children recite huge passages of scripture, chant Latin declensions and conjugations, and sing long expanses of timelines made us giddy with excitement. We began reading books about classical education (such as Recovering the Lost Tools of Learning) and inspecting our budget to see if we could afford to aspire to such an awesome goal. After MUCH deliberation, we sent our eldest daughter to classical kindergarten at this Promised Land of schools. Alas, the whole experiment crashed and burned. Our daughter did not fit the school mold (for many reasons that will have to be discussed in another post on another day) . At the start of first grade, I made a huge leap of faith and decided to homeschool my unconventional daughter. We floundered for several years. She was getting a perfectly good education by state standards, but we certainly were not living up to the classical model we had seen in action at the classical Christian school. Then, at the end of third grade, I was introduced to Classical Conversations. We promptly signed up and have been happy members of our local group ever since. Classical Conversations is a classical homeschooling community where tutors (parents who undergo training and are paid to teach classes) introduce students to new memory work once a week, while simultaneously modeling how the parents should teach/reinforce the learning at home. It has been the perfect fit for our family! First is the “Grammar Stage,” which primarily consists of memory work. Elementary-aged children are hard-wired to memorize. They love to sing nursery rhymes and chant silly poems. They memorize almost effortlessly at this age. So, why not put serious information to music and rhythm? Kids can chant Latin noun declensions and algebraic math formulas as easily as they can quote Dr. Seuss. No, they don’t understand all of the information they memorize. I answer questions if they ask them and let them understand as deeply as they desire to. But the point is to have basic facts (math, history, Latin, English, science, geography, etc.) mastered completely, so that they can be recalled instantly at a later date when they are necessary to gain deeper understanding of a particular subject. These facts are a core of knowledge that students will use to organize all other future learning. It’s like a filing system. My favorite illustration is the grocery store analogy. When you visit your regular grocery store, you automatically know where the items you commonly buy are shelved. Isn’t that amazing that your brain is capable of finding one particular item in that massive store full of millions of different items? But it works because everything is organized in a logical fashion (well, usually). The taco shells are in aisle 3, ethnic food section, 2nd shelf from the bottom. The fudge pops are in the freezer section, top shelf, end of aisle 10, with the other ice cream products. So when my children grow up and learn in depth about World War II, they will be able to file their new, more complete knowledge under the basic history date and fact that they memorized as a young child. And they will be able to place the events of the war into the 160-point timeline they also memorized. They will grasp the big picture of history and be able to make better sense of the more intricate details when they are old enough. Children are old enough to begin to develop a more complex understanding of many subjects in about the seventh grade. This second stage of classical learning is called the “Dialectic (or Logic) Stage.” Children in this stage naturally start to think more analytically and to recognize cause and effect. They love to argue and debate. It is an ideal time to delve deeper into those facts they have memorized. The third stage is the “Rhetoric Stage.” At this stage students learn to relay their knowledge and convictions to others. They begin to write and speak persuasively. The wonderful knowledge and understanding they have gained throughout the grammar and dialectic stages can now be effectively communicated to the outside world. I am sure I haven’t explained the whole process nearly as well as I would have liked (especially since I was not classically educated). So here is a more thorough article by Susan Wise Bauer to explain it further if you are interested. Classical education is a very exciting way to approach learning. It has been thrilling to watch our oldest two children progress through the first two stages. And, surprise! I’ve been learning, too. Unexpectedly, classical education has improved my own feeble brain. Before we joined Classical Conversations, before I took an active role in educating my children classically, I tried to read a book. I won’t embarrass myself by revealing the title of said book, but it was a moderately difficult book that I should have been able to read, having completed two years of college. Yet, I could not get through it. My brain had to do too many gymnastics. I had to re-read and re-read paragraphs to get any meaning, and I eventually gave up. Fast-forward three years. After completing 3 years of Classical Conversations with my oldest two children, I picked up the same book and attempted to read it again. Guess what? I could do it!!! I could read the sentences rather easily now. It wasn’t so difficult. I finished the entire book in a reasonable amount of time. What made the difference? For 3 years I had studied the English language (more intensely than I ever thought possible) alongside my children. I now understood how language worked. In a very verbose and lengthy sentence that seemed to be gobbledegook before, I could now pinpoint the subject and the verb effortlessly. Then I could quickly mentally parse and diagram all the modifiers, and ,voila! The sentence had meaning. I am pretty sure I gained at least 3 or 4 grade-levels of reading over those 3 years! I am also confident enough to write a blog now–something I never thought I would have the chutzpah to do. Please don’t go back and try to find all of my grammatical errors. I am sure there are still plenty to be found. Just know that in 5 years of teaching and learning Essentials of the English Language and Institute for Excellence in Writing (with our CC group), I have improved. A lot.